Tony La Russa was such a highly regarded prospect as a teen-ager that the Kansas City Athletics signed him to a $100,000 bonus in 1962. La Russa was a 17-year-old shortstop for Jefferson High School in Tampa, Fla., when he was signed by Athletics scout Charlie Gassaway and supervisor of scouts Joe Bowman on June 7, 1962. La Russa signed the contract the same night he received his high school diploma. Major League Baseball didn’t have a draft at that time. So any team could bid for a prospect. According to a report by Jim Selman in the June 16, 1962, edition of The Sporting News, 17 scouts representing 14 big-league teams approached La Russa. The New York Yankees and Cleveland Indians joined the Athletics as the top bidders. Athletics owner Charlie Finley met with La Russa in Tampa to seal the deal. In addition to the big bonus, the Athletics wooed La Russa with $8,000 toward a college education and agreed to buy him a new car. La Russa chose a white Pontiac Bonneville with black leather interior, according to Rob Rains in his book “Tony La Russa, Man on a Mission” (2009, Triumph Books). La Russa batted .479 for Jefferson High School in 1962. 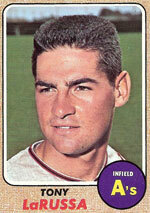 He made his big-league debut with the Athletics at 18 in 1963. Multiple injuries (including a torn tendon in his arm just months after signing for his big bonus) and an inconsistent bat kept him from fulfilling the promise scouts saw in him. La Russa batted .199 in six major-league seasons before building a Hall of Fame career as a manager with the White Sox, Athletics and Cardinals.